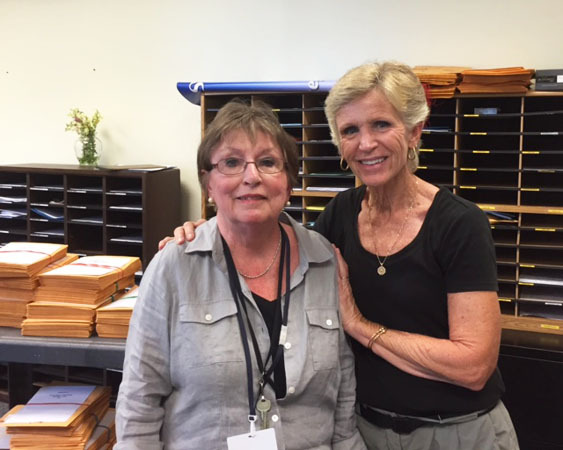 Marilyn Russell, in her new role at the STEM Academy, with her longtime colleague and friend, 8th grade Math teacher Trish Schermerhorn. She has been absolutely extraordinary in her ability to work with all different personalities at Wing. She is beloved by all: students, parents, teachers, and administrators. Her work ethic is top notch. She is extremely efficient, reliable, and diligent at her job. It is not out of the ordinary to see Marilyn working past the end of her work day to complete something that was started earlier that day. If it needs to get done, it will be done on time when Marilyn Russell is involved. On many occasions work has been brought home over a weekend to meet timelines or if it was needed for Monday morning. We call Marilyn the “MCAS Queen”. When it comes to that time of year nobody is more organized or aware of deadlines as Marilyn. The back office at Wing was always meticulously organized with MCAS materials during the months of March/May. Teachers knew if they had questions Marilyn would have the answers. Again, she would never let anybody down and has made a stressful time of year look easy. People that don’t know her will tell you she is shy and quiet, and this is true until you get to know her and then you discover her wicked sense of humor! She loves to laugh. Ask poor Henry T Wing. She had his portrait decorated at different times of the year with the most humorous phrases coming from his mouth. Or every St. Patrick’s Day when she is dressed up as an Inflated Leprechaun. She is fiercely loyal and will tell you her opinion. Take my advice; don’t talk politics with Marilyn unless you want to hear the truth. She won’t hold back! She deeply cares for her colleagues and the children she serves. She has a warm, welcoming personality. She is willing to do what is necessary to serve, support, and encourage students, staff, and administration. She is a devoted wife, mother, and grandmother. She lives through her son and grandchildren. When asked of what she did on the weekend, it is common to hear her talk about going to watch her grandson’s ball games, attending dance recitals, or watching the kids and dog for the weekend. Marilyn is not an educator in the sense of being a certified teacher, yet she is a master ‘teacher’ among us. Marilyn – “You have taught us much by your example, character, and work ethic”. I have learned so much from her and am full of gratitude for her always making the Wing School live up to it’s motto…a Tradition of Excellence. This year she will be working at the STEM Academy and everyone connected to STEM is TRULY fortunate to have her there in the front office. 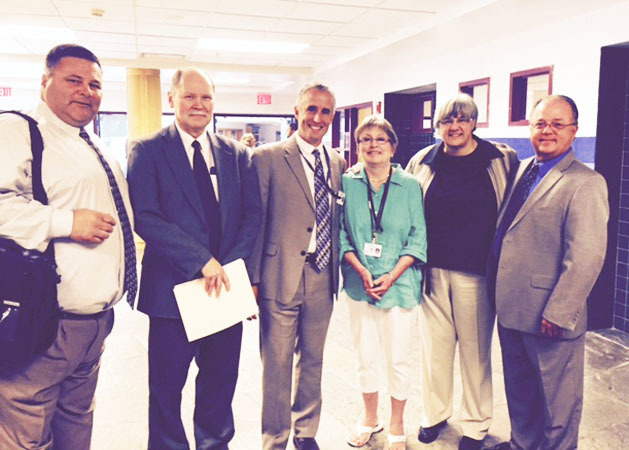 Congratulations Marilyn, as the last… Wing School Employee of the Year!